The United States Mint has announced the reverse design selection for the 2013 Native American Dollar. The series of circulating $1 coins has featured a different reverse design each year since 2009, representing contributions and accomplishments of Native Americans. The latest reverse design is intended to represent the Treaty with the Delawares of 1778. After declaring independence, the United States signed its first formal treaty with an Indian Tribe, the Delaware, on September 17, 1778 at Fort Pitt, Pennsylvania, the site of present-day downtown Pittsburgh. The treaty provided the United States passage through the Delaware Tribe’s land to attack the British at Detroit. The treaty also recognized the Delawares as a sovereign nation and provided the option of joining with other tribes in the Ohio region to form a state. 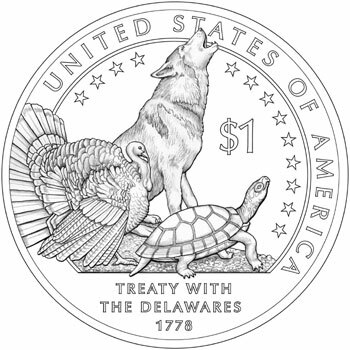 The reverse design features a turkey, howling wolf, and turtle, which represent clans of the Delaware tribe. A ring of thirteen stars is included to represent the original Colonies. The inscriptions include “United States of America”, “$1”, and “Treaty With the Delawares 1778”. US Mint Artistic Infusion Program Master Designer Susan Gamble designed the reverse, and US Mint Sculptor-Engraver Phebe Hemphill sculpted it. This design was selected form a field of 13 different design candidates prepared by the United States Mint. The candidates included multiple alternatives incorporating a paper treaty with quill pens, a cloth pattern worn by the Delaware tribe, and multiple alternatives with the animal symbols of the clans of the Delaware tribe. View coverage of the review and recommendations of the Commission of Fine Arts here and of the Citizens Coinage Advisory Committee here. The articles also include images of the alternative design candidates not selected. 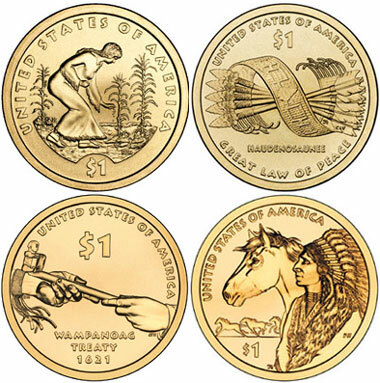 Previous reverse designs for the Native American $1 Coin program have featured agriculture with the “Three Sisters” method of planting (2009), government with the Haudenosaunee or Iroquois Confederacy (2010), diplomacy with the first written peace treaty between Native Americans and the European settlers at Plymouth (2011), and trade routes that helped spread the horse in the 17th century (2012). AWESOME! they totally picked the best design, and arguably the best design yet! I like the turkey, so did Ben Franklin. Good choice !!! I am glad you have chosen this design. I think it is the best design of all the years. Keep up the good work, it is a beautiful coin.